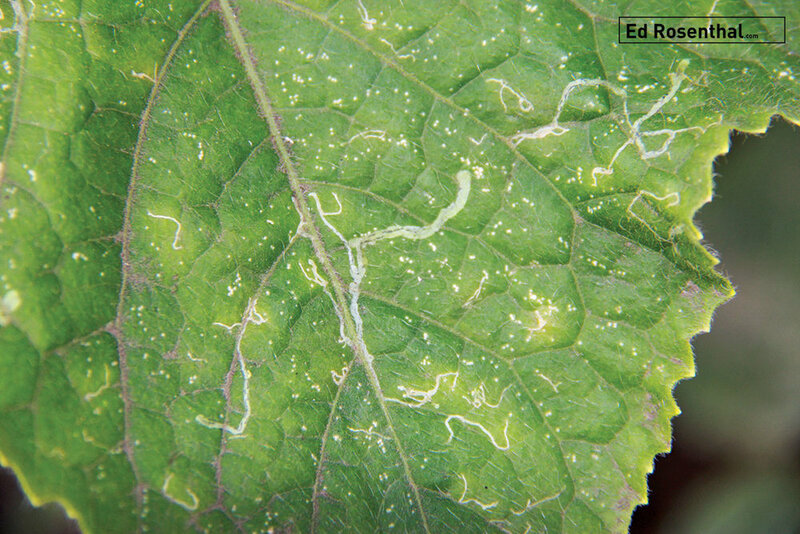 Leaf miners are not common in indoor marijuana gardens. Outdoors leaves are occasionally attacked, but they are not usually a threat to the plant or yield. Leaf miners are usually the larval form of various fly species although a few species of moths and beetles also produce leaf-mining larvae. These larvae are very small maggots, seldom more than 1/10 in (3 mm) long and range in color from white to pale green. The adult flies resemble tiny houseflies, about 1/12 in (2 mm) long. The leaves look like someone carved scribble lines into them. At the same time, they plant their eggs deep inside, and they keep multiplying. When they hatch, the larvae feed off of the leaves until they get big enough to pupate. Pupation occurs within the leaf or in the soil beneath the plant. Once they emerge they repeat this cycle and cause a bigger infestation. Leaf damage causes low yields. When the females dig to lay eggs, plants secrete a sap that attracts ants and flies, thus inviting more infestations and problems. There are many species of leaf miners, and an expert can distinguish between species by the characteristic appearance of the tunnels which evolved to provide them more protection than the surface of leaves. Females implant one egg at a time close together. Species vary in fecundity. Some produce up to 350 eggs each. Eggs hatch in two to six days, and larvae begin tunneling. Eventually they become pupae, either dropping to the ground or remaining in the leaf, (depending on species). The pupae develop into adults and the cycle repeats. Expect two to six generations per year outdoors, but indoors a single generation can take as little as a month, and they reproduce year-round. Outdoors: plant deterrents such as Lamb’s Quarter, Columbine, and Velvetleaf. If only a few leaves are affected, remove and discard them. Natural, Environmentally-Safe Garden Solutions - Pesticide and Fungicide. Made from Essential Oils. OMRI-Approved.